1. Oribe Surfcomber Mouse 2.5oz – I was the most excited for this product when I saw I would be receiving this in my August Sample box! I’m a HUGE fan or Oribe products. I love the quality, the smell, and how long the products last. When I did a little more research on the product, I was kind of skeptical since I originally thought it was a texturizing spray, turns out it’s a mousse. I don’t usually use mousse in my hair when I’m rockin’ the short hair doo. However, I was extremely impressed with how far one dollop goes, and how much volume, texture, and hold it had. Oribe, you’ve done it again! I would definitely buy the full size of this product in the future. A 5.3oz full size of this product costs $37. 2. Too Faced Melted Liquefied Lipstick Peony – I’ve recently become interested in this girly thing called lipstick and lip gloss. I have tried a couple lipsticks from Smashbox and Marc Jacobs, and the lip gloss I use is NYX. This Liquefied Lipstick is amazing! Although I’m not a huge fan of the bright pink I received, I think it’s genius to have a lipstick that goes on like a lip gloss, but has the matte finish and durability of lipstick. A full size of this product costs $21. 3. Ciate Cha Cha Cha Mini Paint Pot – I haven’t actually tried this nail polish yet, but I think the vibrant color is great for Summer. This would have been a great sample to receive in June or July, but it tends to get a little colder in preparation for Fall in August. Even though I haven’t tried this polish yet, I probably wouldn’t buy it since I rarely do my nails. On the rare occasions I do my nails, I will be faithfully choosing Sally Hansen’s new Miracle Gel polish. Great colors, shine, and lasting durability 🙂 A full size of this product costs $8. 4. Jane Iredale Longest Lash Mascara – You want the honest truth? I really hate ANY mascara samples. I am true to only one mascara, and although it might not be the priciest thing on the shelf, it gives amazing volume and length. I am an avid user of Covergirl. However, this sample great for a compact emergency backup for my purse, gym bag, or travel. A full size of this product costs $33. 5. 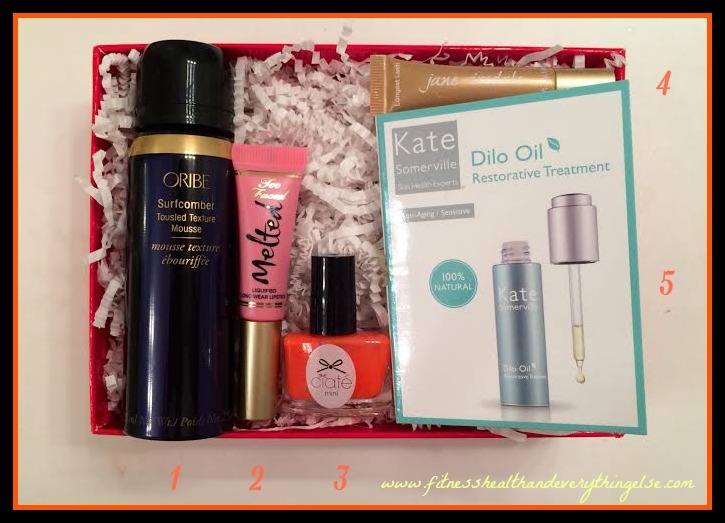 Kate Somerville Dilo Oil – When I saw I would be receiving an itty bitty sample of this dry oil I was pretty bummed out. I have naturally oily skin anyhow so I didn’t think I would use it, plus it seemed like such a small sample I would hardly have enough uses to see a difference. I decided to try it anyways, and man oh, man! Just one use I saw a huge difference in my skin’s overall tone and softness! A little goes a loooong way too. You use only 2-4 small fingertip dots on your cheek bones, forehead, and chin. I really am in love with it, this product definitely ties for ‘favorite’ with the Oribe Surfcomber Mousse! A 1oz full size product costs $65. Pros: This was my first box from my Sample Society monthly subscription and I was thoroughly impressed! They could have ditched the nail polish and mascara, but my absolute love for the Oribe Surfcomber Mousse and Kate Somerville Dilo Oil make up for it. I would definitely buy the full size of the Oribe but the Kate Somerville Dilo Oil is a tad bit too steep in price for me. Who knows! Maybe the sample will continue to do wonders for me and I’ll cave in and buy it! Cons: The mascara was my least favorite product, but I’m VERY picky with my mascara, so don’t base any opinions off my bias! This entry was tagged allure, beauty bar, beauty subscription, ciate, Cosmetics, dry oil, hair product, jane iredale, kate somerville, lipglass, lipstick, mascara, monthly subscription, mousse, nail care, nail polish, oribe, product review, review, sample society, skin care, subscription box, too faced. Bookmark the permalink. oooo.. I might try this. I don’t like my Ipsy. I never get anything I can use!! This has Kate!! Thank you for sharing, Jess. This is my first time signing up with Sample Society, and I loved my box. Can’t wait for next month!